The future looks uncertain for L.A.&apos;s oldest sanitarium, which was originally built as a humane mental health facility for women in Los Angeles county. The Rockhaven Sanitarium in Montrose opened in 1923 as an alternative to the grim treatment offered to women in many mental institutions at the time. And now the group Friends of Rockhaven is hoping to save the historic site, after preservation plans by the city of Glendale fell apart and developers proposed other uses, according to the L.A. Weekly. Home for a time to some of Hollywood&apos;s early notables—including Billie Burke who played Glinda the Good Witch in The Wizard Of Oz and Marilyn Monroe&apos;s mother—the 3.5 acre property was nicknamed the Screen Actor&apos;s Sanitarium. The mental health facility was first developed by early feminist Agnes Richards and features small cottages where residents lived. In 2008, Glendale bought the property for $8.25 million from Ararat Home of Los Angeles, which had used the site for nursing care for the elderly since 2001. The city had hopes to develop Rockhaven into an historic park with a community center and library, but after the recession hit, the plans fell apart. When Glendale&apos;s plans fell though, developers then set their sights on Rockhaven with a variety of plans that included home for female veterans, an all-girls&apos; school, and condos. But the city put the brakes on those plans when the Friends of Rockhaven argued that they would compromise the site&apos;s historic architecture and legacy. The Friends of Rockhaven has now organized as a nonprofit corporation is looking to raise money to turn the property into a publicly accessible park. 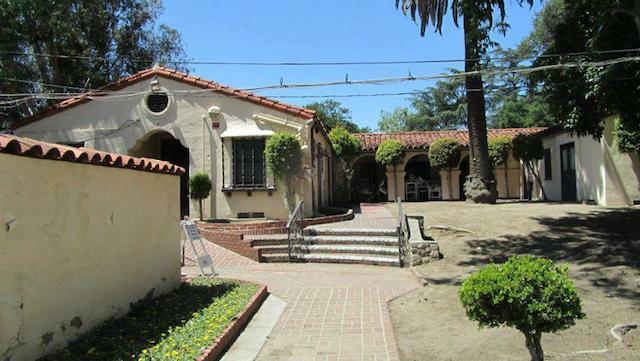 They also hope to obtain California Historical Landmark status for the Sanitarium. But considering Glendale spends $50,000 a year to maintain the property, there are more than a few hurdles for the group to get past. The city also just agreed to let the Crescenta Valley Water District tap a well beneath the Sanitarium to provide water to about 1,200 homes in the area. Mike Lawler of the Friends of Rockhaven, explains that the group remains determined to preserve the Sanitarium, "This land was purchased with the promise that it would be a park," Lawler says. "If [the city] won&apos;t create a park there, like they said they would, then we&apos;ll do it ourselves." Inside L.A.&apos;s Last Standing Sanitarium, Rockhaven from Voice Media Group on Vimeo.